The pallium was a Roman cloak, which replaced the toga as the prescribed court garment for high-ranking citizens, and especially civil officials, up to the rank of senator. It was similar in form to the palla, which had been worn by respectable Roman women since the mid-Republican era. It was a rectangular length of cloth, as was the himation in ancient Greece. It was usually made from wool or flax, but for the higher classes it could be made of silk with the use of gold threads and embroideries. 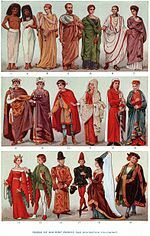 The garment varied in fineness, colour and ornament. It could be white, purple red (purpurea from murex), black, yellow, blue, pale green, etc. The pallium was originally considered to be exclusively Greek and despised by Romans, but was favoured by ordinary people, philosophers, and pedagogues. Tertullian thought it the most appropriate garment for philosophers and Christians. It officially replaced the toga under the Theodosian Lex Vestiaria of 382; the same law prescribed the paenula for senators. It is not to be confused with the pallium used by Catholic clergy, which is related to the omophorion. ^ Vout, Caroline, "The Myth of the Toga: Understanding the History of Roman Dress", Greece & Rome, 43, No. 2 (Oct., 1996), pp. 212-213. DOI: http://doi.org/10.1093/gr/43.2.204.